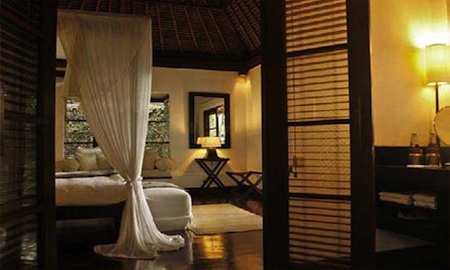 Kayumanis Villas in Bali are the ultimate retreat if you are looking for privacy and luxury. The villas are located in different areas of Bali: Jimbaran, Nusa Dua and Ubud. Jimbaran and Nusa Dua are on the beach, but Ubud (where “Eat Pray Love” was filed) is inland. Personally I prefer Ubud because it feels more spiritual and authentically Bali (see our Eat Pray Love Bali travel guide). The Kayumanis Ubud is a discrete, intimate hideaway nestled amongst groves of cinnamon trees and fragrant blooms. The villas are built on a ledge overlooking a tropical forest and the gently flowing Ayung River. It is the ideal choice for those seeking absolute serenity and complete privacy. There are 23 villas with different themes: Javanese, Oriental, Palembang, Primitive, and Modern. Note that Kayumanis Ubud does not accommodate children below 16 years old. Email the hotel to inquire about a booking. Kayumanis Jimbaran is an exotic and idyllic retreat virtually hidden amongst the hypnotic sway of groves of coconut trees and the romantic embrace of the Jimbaran bay nearby. Every villa is spacious and masterfully juxtaposed amidst the coconut trees. Complemented by an exclusive 24-hour butler service, Kayumanis Jimbaran is the perfect setting of pure serenity and unrivalled luxury. It is open to guests of all ages. You can relax at the Kayumanis Spa, which offers massage and beauty treatments. There are several dining options which can include a romantic candlelight dinner in your own villa. For afternoon adventure, be sure to take advantage of the two exclusive beach facilities, which are only five minutes away. Famous for its stretches of long white sandy beaches and upscale resort facilities, Nusa Dua is also home to Kayumanis Nusa Dua whose villas blend quiet sophistication and understated elegance. An exclusive enclave of luxuriously appointed pavilions, each offers unrivalled space, exceptional comfort, and complete privacy within secluded walled gardens. Kayumanis Nusa Dua is the perfect venue for those who may seek a more adventurous discovery of Bali by day, and yet, demand the utmost serenity and privacy by night. Note: Kayumanis Nusa Dua does not accommodate children below 16 years old.